Hey everyone, today I share the mic with Daniel DiPiazza, founder of Rich20Something, a platform that provides the tools and mindset to radically improve your career and life in the 21st century. Listen as Daniel discusses how his experiences led him to write the book Rich20Something, how Instagram was a huge contributing factor for his success, why he focuses on ROT (return on your 20s), and how he earns most of his revenue from his courses. Invest in building your channel or create your own unique content. Look for an area that is not yet saturated and be the main source of information there. Offer a free trial to show credibility and build trust and then do a sales pitch. Daniel DiPiazza: Your audience knows what ROI is, right? At Rich20 we are focused on ROT, which is not a standard terminology. We are focused on return on your 20s. Do you want to impact the world and still turn a profit? The you're in the right place. Welcome to Growth Everywhere. This is the show where you'll find real conversations with real entrepreneurs. They'll share everything from their biggest struggle to the exact strategies they use on a daily basis. If you're ready for a value-packed interview, listen on. Here's your host, Eric Siu. All right, everybody. 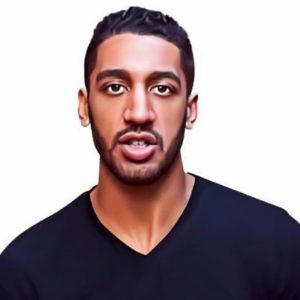 Today we have Daniel DiPiazza, who's the founder of Rich20Something, which is a platform that provides you the tools and mindset to radically improve your career and life in the 21st century, which I'm also going to let Daniel talk about in a little bit. But Daniel, first and foremost, how's it going? Daniel DiPiazza: All right, man. It's going well. Thank you. That was a good introduction. That was one of the better introductions I've had. I've had some weird ones recently. That was pretty good. Eric Siu: Oh yeah. It's just like when they actually don't even know who you are and they haven't done any studying. That's like the worst. I've experienced that a shitload. But anyway, why don't you tell us a little bit first and foremost about I guess who you are and kind of what you do? Daniel DiPiazza: I will answer your question with a question, sir. Okay. Your audience knows what ROI is, right? At Rich20 we are focused on ROT, which is not a standard terminology. We are focused on return on your 20s. What we do at Rich20Something is we look at this decade between 18 and, I mean I'm playing around numbers here, I'm fudging it a bit, but it's like 18 to like early 30s, but that decade in there where you normally would kind of be taking a break, having fun, kind of like living your life and letting it see where it's going to take you. We're taking that 10 year decade, the 10 year period, and we're saying, "Look, this is a period where you have a big opportunity to get a big return on your investment, and if you invest the time into building a business, if you invest the time into improving your relationships, if you invest the time in improving your mindset, and even your physical body, then you're going to reap big rewards in your 30s, 40s, 50s, beyond." We know that this is a critical period and all the work that we do focuses on improving this very important period of life that everyone has to go through, but most people don't know how to handle it. Eric Siu: Got it. Why is this important to you? What's the story behind it? like I had two options leaving school. I graduated school early, graduate college early, and I felt like I had two options. One was more school, which is a safe, predictable option, but there was nothing in my line of sight that seemed attractive enough to spend another X thousands of dollars to get another degree. Then at the same time there's corporate, and that didn't really seem happy to me. I looked at a lot of my friends who were doing investment banking or just different areas of corporate, and it just was not appealing to me. I was left with these middle of the road things. Man, I worked everywhere. I worked at restaurants. I worked at a museum gift shop. I worked at UPS with the little brown short shorts. I did it all. One thing I found was that when I was trying to improve myself, I had to go to all these different resources to figure out what to do with my time and how to effectively use it. Rich20 became the culmination of my own efforts to figure out what I should be doing during this critical 10 year period and how to get there, and so that's what we made. Eric Siu: Got it. Okay. Yeah, can you talk a little more about the business today in terms of I guess revenues? How are you guys going today? Daniel DiPiazza: We're doing well. We just hit seven figures which is nice. We just crossed that milestone I guess it is. We have a couple different components to how we make money. The first is B2C side, so basically creating products, services, and courses for young people who want to figure out how to level up their skills. Whether it's starting a freelance side business and scaling it up, leaving their job, or learning how to create content big as eyeballs, or learning how to get your work featured in bigger publications, or learning how to become more productive, these are all career-based skills that are slightly off the beaten path, and we teach those. Then we also have a B2B side where we work with high level clients, influencers, athletes, entertainers, different types of people who are notable in their field to create digital merchandise. The company's called Digital Merch. What we do is we package influencers and create digital products for them to help basically bridge the gap between them and their audience. Those are the two sides of the business. Eric Siu: Got it. Which one's bigger right now? Daniel DiPiazza: Well I mean, they're kind of all under the corporate umbrella of Rich20. Right now most of our revenue is being driven from our courses, but we're quickly going to surpass that. Eric Siu: Got it. Okay. Great. You know what's interesting, there's a lot of people doing courses nowadays, and there's a lot of great stuff out there, but there's also a lot of junk too. It's interesting because one friend that I know, he does like $6 million a year on courses, but the interesting part is it's doing a lot for him but he's actually trying to get out of it because he doesn't feel good about it. What's your feedback around courses in general right now? Are you guys kind of going to move away from that, or you guys going to do more of it? I'm just trying to get a good idea of because you guys do a lot. GE 206 Daniel DiPiazza Page 3 of 10 Daniel DiPiazza: That's a great question, man. You know what? This will be the first time I talk about this on air. Blood in the water. Look, here's the thing. Courses sell because there's a relatively low barrier to entry, low barrier to entry to finding your customers, low barrier to entry to getting started. Then there's also going to be a lot of competition as you move up the ranks. What we're finding now is that the course business, or the online course business, is doing really well, but you have to be really competitive in order to get noticed. You have to spend a lot of money on ads. You can definitely do it, but it takes a good amount of focus and intentionality and you have to really want to build a business around courses. What we've found is that we enjoy that area of our business, but we're also very attracted and fascinated by the media side. It's kind of like piggybacking. Because of the credibility and the notoriety we've built with our online platform selling courses, now we have opportunity to work with all the influencers. I'm really starting to enjoy that, so I mean, maybe come back in six months and ask me where I see the big bulk of the business coming from. But I do understand what you're saying, and I think there is blood in the water with courses. What I'd encourage people to do is there's nothing wrong with creating courses or digital products, but what you should do is you should look to different areas and different industries that are underserved and go there, because in terms of the entrepreneur space, I think that there are enough people teaching how to start a business. That's not something that's a secret piece of knowledge at this point, but there are probably other opportunities in industries where the market is not so saturated, where you can get a really good foothold and maybe be the only one there, you know? Eric Siu: Yeah. I think the underserved point, that definitely works. What happened earlier today was I actually was talking to somebody that he also does courses too for his business, but he also has a services site. What he said was, and I guess going back to my online education days too, I know that only 2% of people are actually going to get through courses, and this is a number from Skillshare I think. The reality is most people aren't finishing it. What he does is he might charge 299 bucks or something like that per month. This is a all-access pass, and you're going to get access to basically two live trainings each month and it's on new stuff. Could be around marketing, could be around conversion, optimization, whatever it is. He actually has paying clients and he finds that people actually get through the course that way. I think whether it's serving the underserved niche or putting a different spin on it, that could potentially work out, right? got to always look for new opportunities, and you can still teach courses. You can't go online and just copy someone else and do what they're doing. It's kind of like when you Xerox copy something that's already been copied, it get blurrier and blurrier every time until you can't read it. You have to just look for those new areas to serve, man. Eric Siu: Right. Totally. I want to talk about growth for a second. You guys have about, what I think it's over 250K Instagram followers now. Is that about right? Daniel DiPiazza: Yeah. Well, I think we're at like a 235, but yeah we can round up. Eric Siu: Okay. Cool. Yeah, it seems like you have a really engaged audience too. I guess what does Instagram mean to your business? What has it done for your business so far? Daniel DiPiazza: Man, you know what? The thing about Instagram is it's a love-love-hate. It's like two-thirds love and one-third hate. Here are the two-thirds love. The first third is without Instagram our business definitely 100% would not be where it is right now because, and it was just me at the time, I hit on Instagram in March 2015 when there I'd say that it was still working before that but there was this like meteoric surge in popularity at that time. I kind of caught on to that wave. What ended up happening was because I already was selling courses and I was already basically building educational content, I was able to use some of the money that I made, because what I would do was I would post on Instagram, I'd find the best practices, I'd find out what type of posts worked, what type of content worked. I would eventually get more and more followers, and as I was doing that, I would use my courses and I would find people in my Instagram audience who wanted to buy my courses. I would get them to opt in, they would sign up, they'd buy the course. I'd take the money from that opt-in or from that sale, I'd reinvest it back in Instagram by getting influencers to shout me out, and I kind of just built it off the back of the courses I already had running. This was a really good time for that because organic reach was super, super high. It still is, but it was really high then. I kind of just build it brick by brick using the tools I already had. Now that model works, just not as well because it's so saturated with other accounts. I credit and appreciate Instagram for really helping us grow because we built our email list up really, really big that way. When I first started Instagram we went from maybe 7000 email subscribers to now we're over 150,000, 152,000. We've build up the email list. We also gained a lot of popularity and notoriety in the second third. Becoming an influencer in the space has been really, really helpful. It's opened up doors for me that I didn't think were even there. It's given me opportunities that I had no idea I was going to be able to have. work because if you really want your Instagram to work, yes you could automate it or you could hire someone to just do it for you, but it doesn't work that well if you just outsource is. You really have to be on there. You have to be talking to people. You really have to make it part of your life. Sometimes that can get really exhausting because there's some cognitive like drain on that. There's some intellectual strain on always being connected to hundreds of thousands of people and having to respond. If you follow me on Instagram, you know that for the most part I respond to all comments. I dive in those DM's and those have helped our business considerably, but it also is a drain. Eric Siu: Got it. I guess let me change it to something that might be helpful to the audience. If people in the audience that are trying to build up their Instagram following, they're trying to become influencers, what would you recommend that they do? The big thing I think is obviously having them manage it themselves. What else do you think kind of led to where you are now with Instagram? Daniel DiPiazza: Yeah, the number one thing is engagement, but I would say like, look here's what I'll say. The meta-message about Instagram is watching the trends is what's important. Yes you can still blow up your Instagram now by posting really, really great content. For instance, if you're already a celebrity it's obviously much easier. If you have a specific talent, like you are a performer or you take really good photographs, it's going to be easier. If you have a specific niche that's again underserved and there's not going to be a lot of people posting the type of stuff you're posting it's going to be easier. But if you're just posting motivational content and you're reposting images that someone else with a bigger account posted, it's not going to do as well. Now is not the time to be reposting images all the time. You can do that occasionally, but if you look on my account now, I stopped reposting images. I only do two types of things. I do original videos that I make in house. People say, "What app do you use to make those videos?" I use Final Cut Pro. That means we have to actually make them on a computer and export them. We do a really good job of making those. Or I do my own quotes and I make up my own things so they can't be copied and I'm not copying from anyone else's page. These are the types of things we have to do now. posting great content or great pictures, thinking about how you can make a really interesting live stream experience for your audience, and that's how you can ride the next wave rather than trying to just ride the coattails of a wave that might have already peaked. Daniel DiPiazza: Mm-hmm (affirmative). Crowdfire, yep. Eric Siu: Think it's Crowdfire, but you'd unfollow and follow. What's your take on I guess page shouts and kind of these follow/unfollow tools now? Daniel DiPiazza: Page shouts are the best. Page shouts are great. Like I said, that's one of the way that we built the account. I probably invested about $30,000 into growing the account in the first six to nine months, which it's hard to track exactly ROI because the metrics aren't as reliable as if I were to put the money into Facebook Ads, which Instagram Ads came later. But what I can tell you is that within the first year we hit 100,000 followers, which is pretty good. I know that after a certain amount of time it like organically grows because there's enough traction, but I was growing quickly because I was getting big accounts to shout me out. I was doing that because I had a funnel where my courses were being sold and I was reinvesting that money. I think now page shouts are a great way to grow, but not everyone has the funnels or the money or whatever. Again, I think that if you don't have a lot of money to invest, you have to find a really unique angle. It's kind of like podcasting now. It's like why start another business podcast? Yes you could just because you love it and you want to talk to people, but if you want to perhaps reach the top of the iTunes charts, you should start something that's like a completely offbeat angle because then you're going to be the only source that people are going to be able to go to for that information. If there's 100 other podcasts, 100 other Instagram accounts, all doing the same content as yours, it's going to be hard so you got to find a way to stand out. Daniel DiPiazza: Yeah, it's totally true, man. I also like the idea of the mini podcasts. I don't know if you know. Do you know Jim Kwik? Daniel DiPiazza: He does that too now with his podcast where it's like 10 to 15 minutes on just how to get smarter, how to read faster, how to get more productive. I like that stuff because although I like making podcasts, because I have a podcast too, I don't listen to them as much as I like making them, you know? Eric Siu: Right. Totally. Yeah. For those of you looking to start a podcast, I would say if you're trying to do like a interview podcast kind of thing, it's like what's your unique spin on it? Daniel can talk about kind of his unique perspective in that lost decade, or for me I can just nerd out on marketing all day. It's just what unique spin do you have on it, and then take advantage of that, because there's so many Andrew Warners and John Lee Dumas' out there. You have to think about how you can separate yourself. But anyway, so you've made Instagram work well for you. You have your email list as well. I guess I want to talk about your funnel really quick. You talk about your funnel. Can you explain what that looks like through Instagram so people understand what that journey looks like? Daniel DiPiazza: Yeah. I think right now, if you were to go to my Instagram profile @rich20something right now, you probably wouldn't see as much of the stuff we were using back in the day to grow it because since it's grown pretty well now we use it as a tool, as like our front-end marketing piece on social media where we can just put up whatever what we're currently promoting. Right now if you look at it, it's different things. It's either straight to the book, or I just put out a mix tape last week which is doing really well and was a lot of fun and it funnels to that. But strategically what we've done in the past to funnel people in, and this is the method that we used to start making money with the Instagram account and then funnel it back in was we would just essentially have a link to one of a few free opt-ins. One would be like a quick start guide on how to freelance online. At the time it was referring to Elance but Elance is now Upwork, so it was like a quick start guide on that, or it could be a seven day minicourse. I have a seven day miniseries on how to find a profitable idea. We made landing pages for those using ClickFunnels. Super simple. Took about 20 or 30 minutes total to get all those done. Then we basically linked them to our autoresponder in Infusionsoft. They really end up doing the same thing. people are kind of ushered into this secret portal. Basically what it is is it's like this collection of some of my best performing blog posts, some really interesting videos, some cool downloads. They feel like they're getting a real course for free because there's a lot of really good information that's set up as if it's a private membership only site. They're directed to this side of the website that most people don't know about, they're getting these daily emails about how to start a side business, how to come up with good ideas, and this really works well. Again, targeting is really important as a marketer. This works well for the audience that is attracted by Instagram because a lot of people are beginners. We introduce ourselves, we build up trust, we show them that our content's legit, and then after that seven days we have a seven day sales sequence. It's not even too hard of a sell. It's mostly just, "Hey listen, you've been here for the past seven days. You know what we can do for free. Imagine what we could do if we worked together in a paid capacity." There are links to our sales pages. We do live webinars. We'll do follow-ups. Over time that created enough money for us to just keep funneling it back into the course. Eric Siu: Great. Awesome. The other side of things, what I'm thinking about because it sounds like you're creating a lot of content all the time. Just so people understand, how many hours do you think you're spending on creating content every single week? Daniel DiPiazza: Well, it depends. Me personally or the company? Daniel DiPiazza: Well, me personally right now I would say I'm in probably one of the lower creation stages of my life. It's gone in an arc, kind of like in a wave. Throughout last year, I was creating a lot because I had to finish up the book, which is maybe 220 pages on paper. I don't know what is it like 278? Let me look, I have the book right here. It's 278, 278 pages on paper, which is like 70,000 words. Then I did last year I had a really good sprint where I did 90 days of straight writing and publishing interspersed with regular blog posts that year, and then I also produced a whole album of music. I did a bunch of different stuff, so I was creating every day and I was probably spending at least, man, at least three hours on it every day. It was a part-time job. Nathan. I had to write a piece of the blog post that I wanted to give him. I'm like, "Man, I haven't written anything in a few months," even though I just wrote a whole book. I think it goes in waves. Eric Siu: Right. Okay. Talk about the book a little bit. What is the book? Daniel DiPiazza: Oh, the book is a journey, man. The interesting thing about the book, and it's called Rich20Something, but the interesting thing about the book is that it's kind of like it's half autobiographical, half tactical, or half strategic. That's what makes it so real. A lot of the books that you'll read on business or especially for this demographic, for Millennials, for young people in their 20s and 30s trying to figure things out, a lot of them are very much watered down, kind of regurgitated advice. Some of it's really good advice, but what happens is there's a disconnect, because when you read books that have the same advice you've read before, it's easy to roll your eyes and it's easy to say, "Oh, I've heard that." Once someone says that, they check out mentally. Even if it's good information, they don't receive it. Have you ever talked to your parents and they tell you something that you already know, and you should be doing it but you just don't? All the time. Pretty much everything they say. This book frames the ideas that have really worked for us with our business in the context of what actually happened in my life to get me to that point of understanding that. I think when people can understand kind of the journey that I've had to go through since 2012 building multiple different businesses up, from SAT test prep tutoring, to consulting, to doing web development, to starting this content platform, when they see the actual journey, rather than just hearing about the highlights, when they see the lowlights too, they're going to understand why this stuff was so important and it's going to stick a lot more. That's what makes this book stand out. Eric Siu: Love it. Okay, cool. Well, we're going to have to drop a link to that book in the show notes. When is that book supposed to come out again? Daniel DiPiazza: Coming out May 2nd, 2017, but you can preorder it right now, or if it's already past May you can order it, rich20something.com/book. Eric Siu: Love it. Awesome. Well, besides your book, what's one book you'd recommend to everyone? Daniel DiPiazza: One book I would recommend to everyone. Depends on do you want to go spiritual? Do you want to go business? What do you want to do? Eric Siu: The first one that comes to mind or the best one you can remember. GE 206 Daniel DiPiazza Page 10 of 10 book is a recollection of all the mental processes that were going on with him while he was in this period of really high stress and anxiety. He made it into this really interesting self-help manual that allows you to detach from a lot of the anxieties of modern day world. It's a super short read, but it's very powerful. Eric Siu: Great. Awesome. Well, we're definitely going to link to the book in the show notes, but Daniel, what's the best way for people to find you online? Daniel DiPiazza: If you go to any social media platform, first you're going to type in that @ symbol, then you just type in rich20, 2-0, rich20something, and you'll find me. I'm on all of them. Eric Siu: Awesome. Daniel, this has been great. Thank you so much. Daniel DiPiazza: Appreciate it, man.